Massachusetts is blessed with a lot of super ice cream spots. 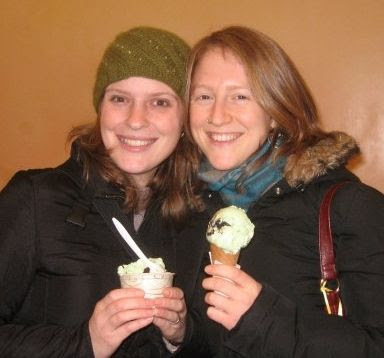 It's often joked that no matter how cold it is outside, you can still find many a Massachusettsians having a scoop or two...case in point: in the photo at right, my friend Rachel and I enjoy an ice cream after trudging a mile and change through slushy Waltham on December 19th of last year. My friend Chris sent to me a link to a great audio slide show by the Salem News about how Richardson's in Middleton, Massachusetts makes their ice cream. (Thanks, Chris!) I had their ice cream at the Reading Jordan's Furniture a couple of years back, and though I don't recall what I had, I do recall loving it. Making the ice cream extra special to me now is what I saw in the audio slide show: the history behind it and the family owned and operated feel that still seems to remain. Richardson's site says it has been around since 1695 (!) as a dairy and has been making ice cream since 1952. That's 314 years of running a dairy and 57 years of making ice cream. You can't go wrong with that much experience! What's best about this is that it is rare you get such a thorough tour of ice cream production...thanks Paul Richardson of Richardson's and Deborah Parker of the Salem News for a great tour!